rating: 4/5 [in the genre] or 5/10 [all books I’ve ever read]. Charlotte Amelia Caprice may seem like an ordinary girl. She has a job she hates, a boss she despises, and zero romantic prospects. Her friends call her Charlie, when she can keep one for more than a few weeks. Though Charlie may seem ordinary, she is anything but. Charlie doesn’t have a heart. Instead, she has a steam driven machine in her chest, always making her feel less than human. Gears and pistons have been using her own body heat to pump her blood for over a decade. There is one small problem. Her heart is beginning to break. When Charlie meets a brilliant man, one who could save her life, she must choose between being heartless and being alive. A simple choice for some, but for Charlie living on steam isn’t easy. Steam is an ambitious story that combines elements of light sci-fi and steampunk with classic boy-meets-girl. 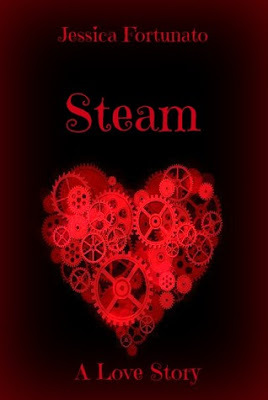 Only boy is a socially awkward med-school dropout recluse and girl is a steam-driven hybrid. It's a compelling concept that makes for an entertaining read. The romance between Viktor and Charlie is cute and the whole bioceramic heart thing brings up a lot of interesting ideas about what it means to be human. My main complaint is that, as my creative writing professor always used to say, I'm getting the feel of a novel stuffed into a short story. The ideas and plot here could have been more deeply explored in a longer work. So the end result is a fun story, but left me wanting more. Like I said, I felt like the plot had to be crunched. There's a lot of hints for development between Viktor and Charlie, but so much is condensed that we're left to assume a lot of what's going on. Which can be fine, but here I just felt like something was missing. Like I wanted to see more of their exchanges, more stolen glances, more hints of initial longing and lust before that steamy (ha, I crack myself up) first encounter. The whole heart failing thing does give a nice sense of urgency, which kept me reading. So clever. Automatons are a common Victorian element and it's fascinating to see the idea used here as sort of a cyborg concept, but not so much the "I'll be back" variety. A love story growing out of it is interesting as well, because (as Fortunato cleverly points out in the text), so many emotion words are tied to the heart. Heartbroken. Heartwarming. Heartsick. It's a clever commentary on how we think about life and love. I liked Viktor and Charlie but felt that I couldn't fully get a sense of them. Viktor starts out this sort of recluse living in his brother's basement who gets anxiety attacks whenever his past med school experience is mentioned. Then not long after, he's spilling his soul to Charlie. There was development there that I didn't fully get because of the short nature of the story. Charlie was much more accessible, but I still would have liked more time to watch her wrestle with her unusual situation. Fortunato has a nice style. It's clean and it doesn't sacrifice beauty despite the conciseness. It's good genre writing that supports the story rather than overshadowing it, but does pause on some lyrical moments that catch your eye and make you think. There were a few things that jarred me, like too few contractions, but it was nicely polished otherwise. A clever commentary on love and life that really left me wanting more.